A mail, parcel and e-commerce corporation in the Netherlands, has just started using the first two Renault Master Z.E. built in Europe. The 100 per cent electric LCV will play an important role in PostNL’s ambitious objective for reducing CO2 emissions. PostNL aims to achieve CO2-free deliveries in 25 inner cities where it operates by 2025, and the Renault Master Z.E. is already proving to be the ideal way to help achieve this. The new Renault Master Z.E. is equipped with the latest generation 33kWh lithium-ion battery. As a result, the commercial vehicle is able to realise a real-world range of approx. 75 miles, which makes it ideal for ‘last mile deliveries’ in inner cities. The interior of the Master Z.E. has been carried across from the Master to provide a mobile office, while the battery charges in just six hours with a 7.4kW charger. The Renault Master Z.E. will be available in six versions with loading space of between 8 and 13 m2. 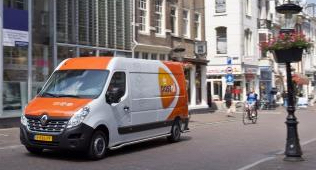 PostNL will use a fleet of seventeen Renault Master Z.E. models by the end of 2018. The Renault Master Z.E. was exhibited at the CV Show 2018 and first UK and Irish deliveries of the large panel van will start late this year. Renault is Europe’s leading electric vehicle manufacturer for both cars and vans. It offers a line-up of electric vehicles including the multiple award-winning ZOE supermini, with its enhanced 186-mile ‘real world’ range, the Twizy urban quadricycle and the Kangoo Van Z.E. 33. The Master Z.E. is an all-electric version of Renault’s large panel van. It will join the line-up towards the end of the year.